Thanks so much for all your support so far. It’s really important to object again even if you have already objected to the previous schemes so that we can achieve a positive future for this site. Please do it today – don’t forget. The Council have said this application will go to a decision this time – we hope so. The Craighouse Partnership’s (Mountgrange, Napier University and Sundial Properties) excessive and ugly plans provoked the largest number of objections ever seen by Edinburgh planning department for a single application. Thousands wrote in to object to excessive newbuild against policy on this protected site – one of only 8 Areas of Great Landscape Value in the whole Edinburgh area (others include: Arthur’s Seat, Silverknowes Sands, Botanics and the Hermitage of Braid). Find Simple Search put in the application number: 12/04007/SCH3 and it will come up. Click on log in and follow instructions and write your comments. We recommend also sending your objection to councilors, so email is probably easier. Remember: put the planning reference no: 12/04007/SCH3 address: Napier Campus Craighouse as well as your name, address and the date. “I object to Scheme 3 (ref: 12/04007/SCH3). This is not a real enabling development and contravenes planning policy. I want the Council and community to work together to make sure the woodland and greenspace is preserved and the listed buildings developed positively in line with the alternative community plan”. Please Object to Excessive Scheme 3 – even if you objected before: If you have already signed a petition or wrote in last year, thank you, but it is very important you write in to object again if you disagree with the new. Get family/friends to write in separate letters or emails as they are counted as separate objections (multiple names on the same letter won’t count as separate objections. A short letter is better than no letter – get everyone you know who cares to write in. Together we can save this beautiful site. What to Write – This doesn’t have to be like a solicitor’s letter, just put it in your own words. Please include at least one material planning objection to make sure to count in planning terms. 1. This site is protected against newbuild development in planning policy. 2. There is no Enabling Development Case: The enabling case is deeply flawed and goes against the guidelines. The site will be spoilt and there are viable alternatives. The newbuild is not a proven minimum. The sales prices for the listed buildings are artificially low and the conversion costs inflated. The A-listed buildings are profitable developed alone. 4. New-build ruins the setting of the Grade A Listed Buildings against policy: the setting and views of the oldest building – Old Craig built in 1565 – will be spoilt by Burton a large 5/6 storey block. New Craig and the villas will be dominated by large imposing and very long housing blocks in the woodland. Clouston will dominate its historic neighbour, Bevan. 5. The character of the Conservation Area will be spoilt contrary to policy which protects the setting of Victorian buildings against dramatic landscape backdrops (see above). The new houses and carparking at Craiglea Place are out of keeping and spoil the country feel of the entrance of the site and Right of Way. 6. Loss of Public Amenity with loss of open space and beautiful woodland and views. Areas of traditional walks destroyed. Loss of beauty, naturalness, mature trees and views. 7. Roads/carparks 308 carparking spaces will turn areas of Open Space to brownfield against policy. The road report is worried about increased hazards to children and pedestrians. 8. Schooling: the number of dwellings will create more strain on local schools. Flooding – Balcarres St, Meadowspot and Craighouse Rd: there are questions about the potential for increased flood-risk from extra car-parks and buildings. 9. Trees and Wildlife: loss of mature trees and removal of woodland which is the habitat of local wildlife and of protected species such as bats and badgers. As a Local Biodiversity Site and Nature Conservation Site, the wildlife should be especially protected. 10. Views and Skyline: The plans spoil the spectacular protected views both into and out of the site with large 5/6 storey blocks overwhelming the existing Grade A listed buildings. The view from Blackford Hill will be spoilt. 11. Precedent. This amount of new-build contravenes the Local Plan and its numerous protections and policies creating a dangerous precedent for Edinburgh’s other historic sites and green spaces. BUT REMEMBER – THE KEY THING : Object to the Planners by email, letter, or online and please make sure the planning department receives your objection by midnight on 4th July 2014. Two years ago, Mountgrange (an off-shore Isle of Man Opportunity Fund) and Napier submitted an application for a luxury housing estate on Craighouse – a protected green and historic site on Edinburgh’s seventh hill and which – like Arthur’s Seat and Blackford Hill – is one of only 8 designated Areas of Great Landscape Value in whole Edinburgh area. The application – called “factually incorrect” and “inaccurate” by the Council, provoked the largest amount of objection letters the planning dept’s ever received for a single housing application. Thousands wrote in and signed a petition to protect this special site. This has had an enormous impact – thank you all who wrote. However, Mountgrange are a powerful company and last summer we found out their lobbyists were arranging meetings with Scottish Ministers to try and force the scheme through against the protections, the will of local community, our MSP, MP and local Councillors in the manner of the Trump golfcourse. So far they haven’t succeeded. But it’s very important for the community to give them a clear message we will not stand for this. Then, for the second Christmas in a row, Mountgrange and Napier submitted their “scheme 2”. But disappointingly failed to reduce the amount of newbuild, simply moved bits of the newbuild around with large apartment blocks replacing terraces. The number of newbuild dwellings, in fact, increased from 89 to 125, the total dwellings (new and old) went from 153 to189 – meaning more pressure on schools, roads, more traffic and more pressure on what is a beautiful protected nature site. The square footage of the newbuild also increased – to more than all the existing historic buildings put together. They claim the whole scheme would cost about £80million – however their figures show it costs only a quarter of this to convert the listed buildings. This “scheme 2” received so many objections that the planners have been unable to count all of them, but the planners still allowed Mountgrange to submit a “scheme 3”, which is only slightly different. The latest Scheme 3, removes just one building from the scheme 2 plans. There is still more newbuild than old. There is still a 6-storey tower block at the top and a massive block at the bottom, spoiling all the views. There are still 4 development sites within the woodland. The planners have insisted that this time really is the very last time they can submit a further scheme before going to a decision with the councillors. The site comprises Grade-A listed buildings in a spectacular wooded and parkland setting and is one of Edinburgh’s beauty spots – heavily protected as: an Area of Great Landscape Value; a Local Nature Conservation Site; and as the setting of unique Grade-A Listed buildings in a Conservation Area. The site has some of the most spectacular views in the whole city. The plans show no respect for these protections. No one opposes sensitive conversion of the listed buildings but there is no justification for this excessive development. If this is allowed to go through it will be open day on protected sites around our city. Please help save this beautiful protected site. Thanks so much! Can I also point out the “extension to Craiglea Place” which has only now appeared in this last set of plans. Six large ugly houses which will entail the cutting down of numerous trees and the opening up of that quiet corner of the site to more traffic than just the walkers, and dog walkers, that currently make use of it. We were PROMISED no extra traffic in Craiglea Place, partly due to its lack of width and partly due to the sheltered housing for elderly residents that runs alongside it. But no ….. This is quite right. Unfortunately I’m not sure whether what was promised or said by developers counts in terms of material planning considerations. But this extension will spoil a peaceful quiet cul-de-sac and Right of Way and make a road entrance where there is presently a lovely listed entrance. This is printed on the leaflet that we are having made. The material planning objections that we’ve posted (above) are slightly more general because so much is contravened by this plan – which is simply excessive. But we will also be writing posts on all the individual issues over the next month and looking at the protections and material planning considerations in relation to them – Craiglea Place will get its own post and we will also be researching the protections surrounding that area for people to use. Our massive detailed researched letter will also be made available. 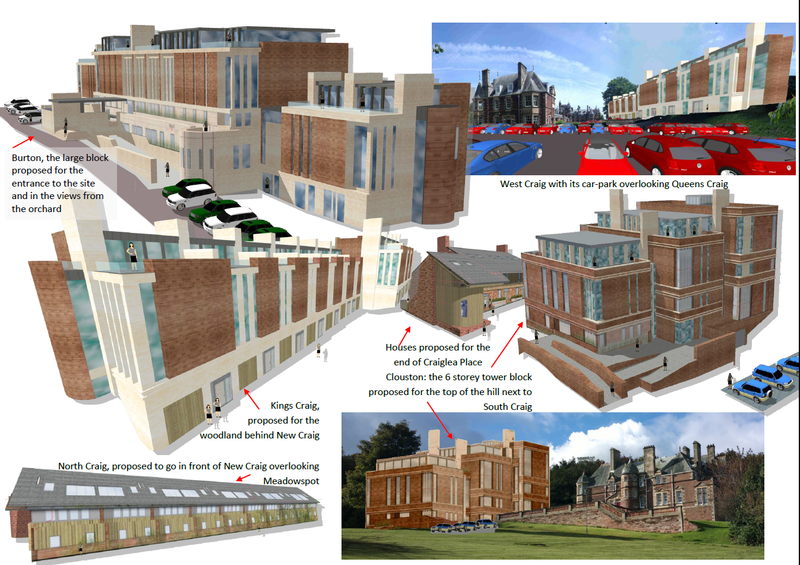 Initially I had little objection to a scheme to redevelop the Craighouse site. In my naivety, I hoped (assumed) that the conversions would only apply to to the buildings already on-site. Seeing the plans a little late to lodge an objection, I hoped I would hear a great deal of discussion and interest from locals. I am a recent incomer to the area. The site is a green site with ‘Rights of Access’ and Protection Rights on buildings, trees and landscape. I had grave concerns about the proximity of ‘new build’ so close to the Lodge House and the introduction of modern construction buildings, possibly aimed at ‘professionals and transient employee’s. They would for the main part bring in cars, pets, children and their relations/ visitors to the site, possible spilling outside the scheme on to the already narrow roadway. I wish to add my name to defend this site and the local population, as much as possible. Hi John, Great to have your support. Please make sure you follow the instructions above and object officially before the deadline. The easiest is to email Emma Wilson: emma.wilson@edinburgh.gov.uk with your objection. To keep up to date with what is happening, you can also ‘like’ our Facebook page and/or email us to join our group: friendsofcraighouse@yahoo.com. There was a huge number of objections to the previous plans which had a big impact with politicians and planners, so we hope you can officially object this time and stop this scheme too. And make sure friends and family individually object as well. You are right about the cars and the right of way, there are 323 car-parking spaces and 189 properties. It doesn’t seem likely that there are enough car-parking spaces for all the properties. There is a right to roam on the site, and so anyone who doesn’t know that should be told, because it is a beautiful site and the public have the right to enjoy it.